When the gluten-eater is away, the FODMAP eater will play…. This past weekend, my husband went out of town, which left me plenty of time to cook and experiment. We are not on the same diet, and at times, I feel bad forcing him to eat low FODMAP food when he doesn’t have to. I decided to experiment with breakfast, dinner, and dessert. 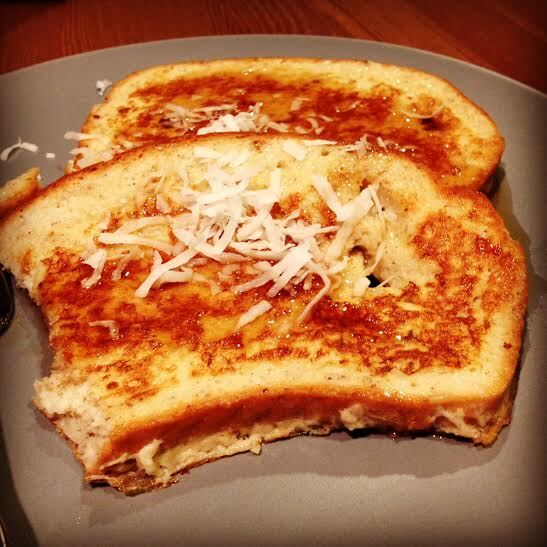 For breakfast, I made Coconut Creme French Toast, and it was great! Fluffy, slightly coconutty, and decadent. Not to mention, incredibly easy! 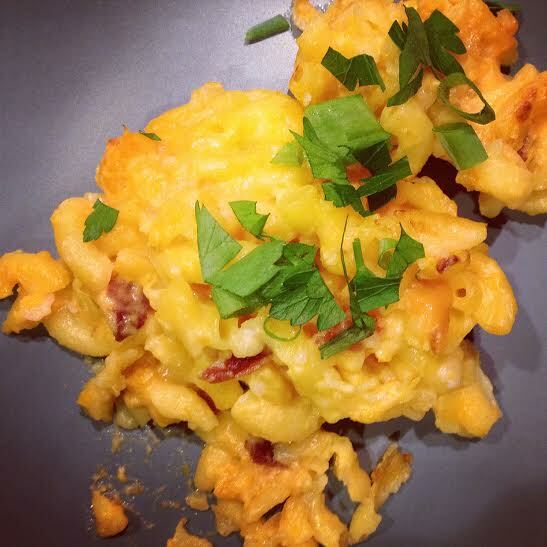 Dinner consisted of Butternut Squash Bacon Macaroni and Cheese, which is sweet, smokey, and perfect for a cold day. 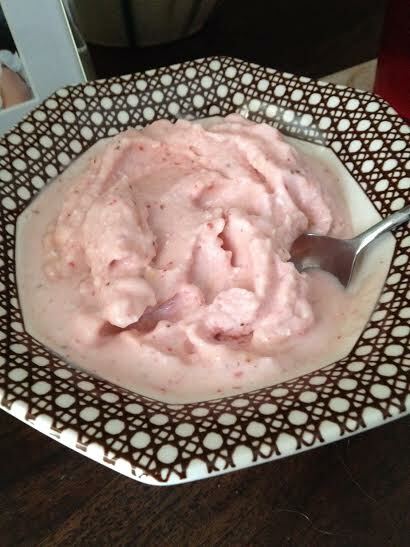 Finally, I made Strawberry Pineapple “Ice Cream” with coconut milk and maple syrup. Again, incredibly easy, and just sweet enough to cleanse the palate after dinner. See below for all recipes! Heat skillet or pan over medium heat. Add coconut oil and swirl around the pan to grease it. Combine coconut milk, almond milk, eggs, vanilla, and cinnamon in a shallow square dish, and whisk until eggs are completely combined. Adding bread one piece at a time, coat bread with this mixture on both sides. Let excess run off, and add bread to the skillet, and cook for about 3-4minutes on each side. Move bread to a plate. Top with maple syrup and coconut flakes. Enjoy! This recipe is merely a variation on my standard french toast recipe. What I love about it is that the recipe is versatile. You can make any kind of french toast you want just by slightly changing the liquid and spice involvement. Why use full fat canned coconut milk? Simply because it is fluffy, creamy, and rich! I have used boxed coconut milk before and found it did not give the same texture or coconut taste. Preheat your oven to 425F. Heat a large, deep pan over medium heat. Add squash and 2 cups of milk. Cook until squash is very tender, about 30-40 minutes. You’ll know when it’s done when you can push a spoon or fork through it with very little effort, and your pushing causes the butternut squash to fall apart. While this is cooking, get your pasta going. In my opinion, it’s not ideal to start the pasta first, especially gluten-free pasta. If you cook it too soon, then have to wait until the squash part is done, you’ll end up with very clumpy, gooey pasta. As the squash process takes about 30-40 minutes, start the pasta at the 35 minute mark. Once squash is “squashable”, add 1/4 c. milk and 1/4 c. flour in a slurry, stirring frequently. Your sauce will thicken up at this point, and more of the squash will start to fall apart. I found that gluten free flour gets really clumpy, so make sure to stir and break up all the little flour clumps. Add in 6 oz of smoked cheddar, stir until melted and blended. Add in the pasta, stir to coat pasta completely. Add bacon, stir again. Add the pasta mixture to a 9×13 baking dish greased with coconut oil, and sprinkle remaining cheese on top. Put in oven and cook for minutes, or until cheese has melted and is getting bubbly and brown. Remove from oven, and sprinkle scallions and parsley on top. Serve! Add milk, strawberries, and pineapple to a food processor. Pulse until you get a soft-serve ice cream consistency, adding a little of bit of coconut water to help facilitate blending. Stir in maple syrup, and serve. Keep leftovers in a plastic container in the freezer. And there you have it! I love experimenting with food and making it low FODMAP, or using leftovers (hence the coconut milk) and finding other uses for them. This weekend helped buoy my spirits that you can be creative in the kitchen and eat low FODMAP. In fact, you might have to be MORE creative in order to eat the same things you used to enjoy! I’d love to hear about others low FODMAP experimentation, please share with me! @sexyachymoody it was delicious!!! highly recommend it.